Those cute and cuddly bunnies can wreak havoc in a vegetable or flower garden. Gardeners who've had it with bunnies munching on their plants can choose from several natural remedies. According to the University of Illinois, fencing is the best protection against rabbits in the garden, though natural methods can be used if you're reluctant to add a fence to your landscape. Erect a chicken wire fence to keep the rabbits out of your plot. The University of Illinois suggests bending the bottom six inches out at a right angle to deter rabbits who might try to dig under. The Georgia Center for Urban Agriculture advises gardeners bury the fence at least three inches underground to thwart a rabbit's attempt at digging. Coat the area surrounding the garden bed with a chemical repellent that will naturally deter bunnies. The Georgia Center for Urban Agriculture suggests using dried blood meal or store-bought rabbit repellent. You'll need to reapply these substances frequently to keep rabbits away. Mix a natural spicy solution to keep critters away. Horticulturist Ron Smith combines three jalapeno or habanero peppers with water in a blender to make a liquid, which he then strains through a cheesecloth. He adds two tbsp. of vegetable oil, a squirt of liquid glue and two drops of dishwashing detergent to the strained liquid. Smith mixes one part of this solution with 10 parts water, then sprays the hot pepper liquid directly on garden plants. The plants won't be harmed, and rabbits won't revisit the garden after getting a mouthful of heat. 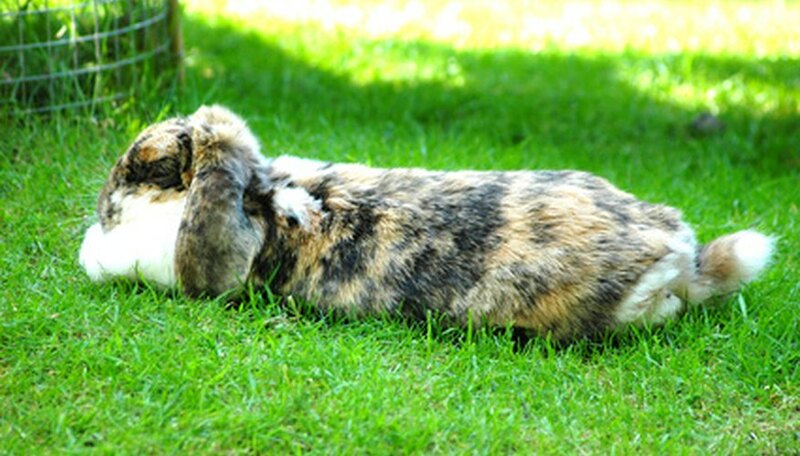 Coat the sides of your garden bed with a thin layer of human hair to repel the rabbits with your scent. You can also use worn shoes or old kitty litter, since rabbits don't like humans or cats. Include plants that rabbits don't like to eat in your planting. If rabbits think you don't have desirable food planted, they won't eat your flowers. The Georgia Center for Urban Agriculture suggests planting poppies, geranium, iris, narcissus, yucca or meadow sage. Combine a fence with one other method for the strongest prevention. Rabbits will naturally avoid raised and container garden beds since they can't hop into them. What Flowers Do Florida Deer Not Eat?